The tragic LUV story about my cat Tonto, was finally published in an anthology devoted to pets and pet rescues. The anthology is from the "Memories from Maple Street, USA" series. I've had a couple of other memoir pieces published in, including, Leaving Childhood Behind and The Best Christmas Ever. 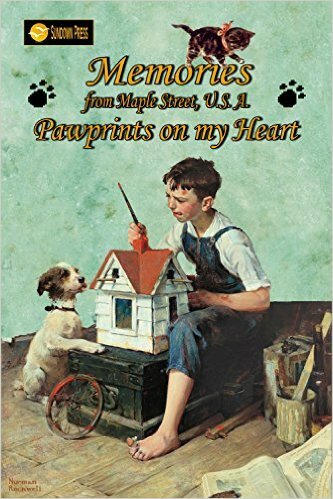 This one is titled Pawprints on my Heart. If you love pets, especially dogs and cats, this would be a great little read. Lots of heartfelt memories about pets. All of the books in this "Memories from Maple Street, USA" series are compilations of short memoirs and are quite affordable. Check them out. I've been invited to speak on a couple of panels at the Southeast Wisconsin Festival of Books in November. The panels are on Writing about Family and Writing Across Genres. The theme this year is Roots and Branches. I can't wait! 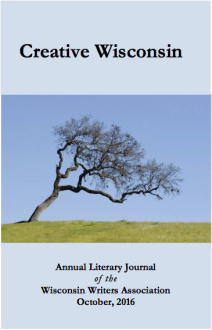 I recently found out that I was one of the chosen for publication in the Wisconsin Writers Association's Literary Journal titled Creative Wisconsin. This will be a bound paperback journal and includes my childhood memoir about neighborhood hockey in Minnesota in the 1970's. This was a really fun piece to write. Words. (My reviews will be featured this Sunday July 17th) 101 Words is a flash fiction site that requires that user-submitted stories be exactly 101 words in length. They also have a Sunday Edition that consists of an author posting links to four different flash fiction stories that they thought were good, and then providing a two or three line review. I was flattered to be approached for this, but it is another spinning plate. Ha! I still continue to promote my most recent eBook of poetry, Reciting from Memory. This is a fun collection of "poems for the working class." Nothing too lofty, just fun and introspective poems. I've had a smattering of poems published over the past six weeks or so. For more on those, visit my publications page at my author website. I am an occasional guest blogger at our church, Collective MKE. Not a huge commitment, but another plate. I am looking down the road at what's next too. I am still intrigued by re-writing/co-authoring a book my deceased uncle has written. As you may recall, I read the book and thought it moved a little slow, so was thinking I'd re-write every other chapter and see if I couldn't help make his dream come true. The idea thrills me - the work involed might kill me. Ha! So that is most (but not all) of it. Throw into this a busy summer schedule and some quality fishing time, and, well, more plates. Thanks again to all of you who take time to read my work, my blogs and offer words of encouragement and support. You are the reason I do it.